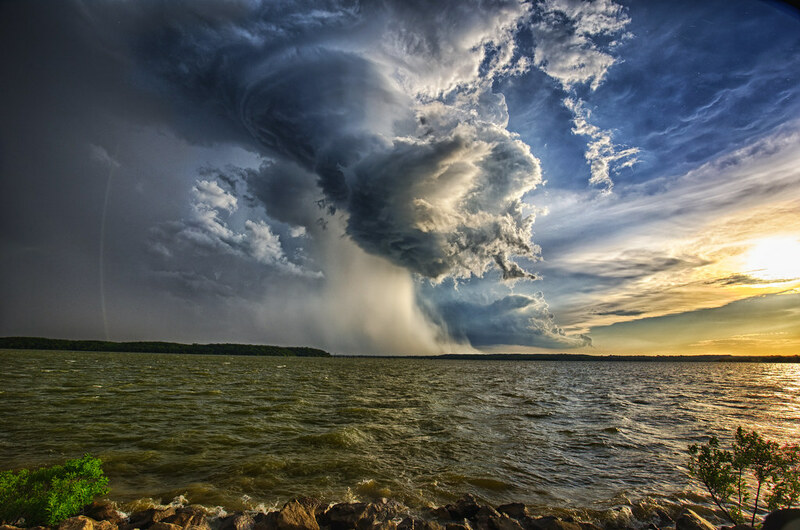 Storm photography is one of the most eye-catching types of photography. Storms make a great subject for both professional and amateur photographers. The natural action, the intensity of light and color, the contrast between the calm setting and the storm clouds or the lightning, they can all be easily captured on camera. A drop of rain or as much as a little wind are enough to ruin many people’s day, but not for a storm chaser. Being a storm photographer means embracing all that Mother Nature has to offer, even if it leaves you drenched and shivering from the cold. If you’re planning on photographing lightning, you must have a camera that allows you to manually set the shutter speed, aperture, and ISO. You don’t necessarily need a DSLR for that, as many compact cameras nowadays let you do this. However, an interchangeable lens camera will work wonder, as always. Speaking of lens, wide angle lens are more suitable when trying to capture the lightning bolt while zoom lens allow for capturing more detail of the bolt. You must set the lens focus to infinity, and it’s also best to use the Manual mode when shooting storms. Back to the camera, it too has to be set in Manual mode. The exposure time varies depending on what you’re shooting. It can be anything from 10-20 seconds to a couple of minutes. If the scene is too bright, then you must increase the aperture. Consequently, if it too dark, decrease it. As for the ISO, increase it the darker it gets, but try not to go too much (keep it at a maximum of 400) because you will compromise the quality of the picture. High ISO means more noise, and you certainly don’t want to go through all the trouble of chasing storms just to have your photograph coming out full of grain. A tripod should be an indispensable tool in every photographer’s kit. Invest in a sturdy, heavy tripod, that will remain well-grounded even if you’re experiencing strong winds. A remote shutter release is one of the cheapest devices in a photography toolbox, but it’s also one of the most useful. As a photographer, you obviously want clear, sharp images. This means the least amount of camera shake. Combining a tripod with a remote shutter release is a winner solution. The remote release is a cable that plugs into the side of your camera and has a trigger that controls the shutter release. This way, you can shoot sharp photographs without having to worry that your shaky hands will blur the image. Storm photography, just as any type of outdoor photography, makes reading or listening to the weather forecast a vital step in the process of capturing photographs of storms. Check weather.com for information, and try to stay away from severe weather that might be too dangerous for you. The best time for storm chaser photography is right before or just after a thunderstorm. You can take stunning pictures of shelf and wall clouds, mammatocumulus, cumulonimbus incus, lightning, or the storm itself. Moving on the clothes, this is another important aspect. You will be spending a great amount of time outside in the cold, rain, and wind. Dress accordingly: warm, waterproof, comfortable items. Don’t bring too much with you out on your shooting trip. A camera, lens, tripod, remote shutter release and some optional filters for the lens are all the tools you need to carry in your backpack. Just because it’s all about shooting storms, storm photography does not mean pointing the camera up at the sky and shooting only the lightning, clouds, tornado, or other elements. You will want to include both the horizon and part of the ground in your picture. Storm chasing can be a simple thing, and you definitely don’t need too much equipment to find them. Watch the weather forecasts and use the radar. This will leave more time for you to set up the camera before lightning strikes. Storm photography also means doing a bit of storm chasing. If you don’t think you have enough time to capture the approaching storm on camera, watch the radar animations and see where it’s heading. Then get in your car and drive to next spot. The camera equipment is not all you need on your storm chasing trips. Bring the following with you on your expeditions: flashlight, extra clothes (it might rain and you will get drenched), food, beverages, insect repellent, emergency cash. Needless to say, don’t bring many metal items with you when shooting lightning. Rather than using an umbrella to keep your camera from getting wet, buy a camera raincoat. It’s practically a piece of plastic that helps keep rain, dust, dirt, snow, and sand, away from the camera’s body and lens. They’re quite cheap, and you don’t have to spend more than $20 on this item if you don’t want to. If your camera allows for it, always shoot RAW photographs. It is recommended you use this format because you will have more editing options using the RAW format than the common JPEG. When it comes to editing your pictures, you can always rely on Adobe Photoshop. Additionally, Adobe Lightroom is a good tool for managing images and also do some light editing. Check out pictures made by famous storm photographers and examine them in detail. It is not about copying the works of others, but rather finding out what is the correct way to compose a photograph, and how to set your camera. Check out the EXIF and you’ll get information on the aperture, shutter speed, ISO, and focal length. You can then go about using the approximate same camera settings on your expeditions. Have a look at some of the most impressive portfolios on the web: Jim Reed, David Mayhew, Mike Olbinski, James Langford, Kelly Delay.